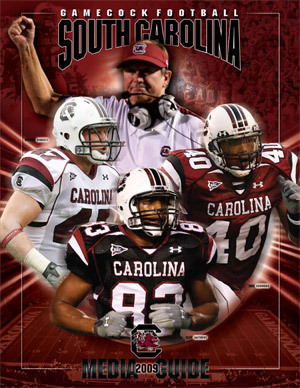 The 2009 Gamecocks sprinted out to a 5-1 start despite a schizophrenic offense that managed only seven points in the opener against NC State and 37 in game two against Georgia. USC pulled a Thursday night upset over fourth-ranked Ole Miss, and a young, non-gas-pumping wide receiver named Alshon Jeffery announced himself to the world in a tough win over Kentucky. After losing four of five during their standard October-November swoon, the Gamecocks rebounded with a satisfying win over Clemson, the first of five in a row. Thoughts and hopes of a Music City or Chick-fil-a Bowl appearance slowly faded away over the next couple of weeks, and we were left in a frigid Papajohns.com Bowl against Connecticut. Nothing about that trip was pretty, and left us wondering if we were ever truly going to turn the proverbial corner under Steve Spurrier. Buck takes us through all the highs and lows of 2009 on this edition of Buckshots, so click here or click the graphic to listen, and enjoy!